Did you know you have been saved 100's of time by now with blue blood.If not here is How? Horseshoe crabs have bright blue blood Their blood kind of sloshes around in their bodies carrying oxygen to various organs, as our blood does. 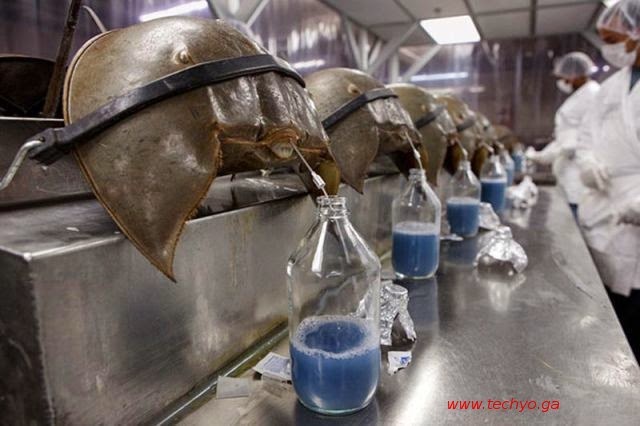 Horseshoe crab blood is used to test drugs and implants for endotoxins. Endotoxins are byproducts of bacteria that remain even after sterilization. Endotoxins, if injected into the blood stream can cause fever, coma and possibly death. A horseshoe crab has blue blood which is copper based instead of iron based like our blood ( that’s why it’s blue instead of red). This blood has another unique quality,horseshoe crabs blood will gel when it comes in contact with bacteria or endotoxins. This action is part of the horseshoe crabs primitive immune system. If a horseshoe crab sustains an injury such as a cut, when bacteria tries to enter it’s body, it’s blood jells which creates a barrier against the bacteria.